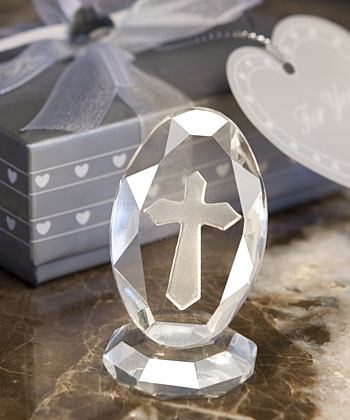 As Christening, First Communion, Confirmation or Wedding favors, these elegant Choice Crystal by Fashioncraft cross keepsakes make it clear that it’s a perfect day to celebrate your faith. Each measures 2 ¼" x 1 ¼" and features a multifaceted crystal base supporting a brilliantly detailed oval, dramatically engraved with a classic cross design at its center. These favors make for a stunning presentation surrounded by white satin inside a Choice Crystal signature silver heart design box, wrapped with an organza and satin bow with a heart rhinestone accent on top and an attached matching heart shaped "For You" tag.